Back from the madness of an overwhelmingly unproductive 3-day weekend, last night’s dinner wasn’t too creative. I have, however, adapted a new mantra so I can keep tabs on myself and posting: No Excuses. Blog like a champion. So I made my favorite kind of pizza, my Smoked Mozzarella , Radicchio and Onion Jam pizza. I posted about this pizza before – you can see the recipe here. Since I’ve been a bad blogger, the last thing I wanted to do was repeat a recipe – which I promise I’m not going to do here. Have you ever craved pizza but didn’t want to settle on generic delivery? Have you ever craved pizza so much that you were even willing to drive to the grocery store only to realize you have no gas? Okay, maybe some of those scenarios haven’t happened to everyone; what I’m trying to get across here is that I have a recipe for thin pizza crust WITHOUT RISING TIME. Yep, you heard me… NO RISING TIME. That’s like, instant fresh pizza – and literally dinner in MINUTES. And I’ve decided to share it with my beautiful blogging community so everyone can have fresh pizza whenever they want. No excuses. Eat pizza like a champion. In a small bowl or liquid measuring cup, heat the water until it feels barely lukewarm when you test it with your finger (if the water is so hot that you can’t leave your finger in it, wait for it to cool down). Add the yeast to the water and use a fork or whisk to stir it into the water. Set this aside for a few minutes and allow the yeast to dissolve. It’s ok if the yeast doesn’t bubble, but it should be entirely dissolved and the mixture should look like thin miso soup. Measure out the flour into a large mixing bowl. Add the salt and use your hand or a whisk to combine. Make a well in the center of the flour and pour in the water-yeast mixture. Use your fingers or a wooden spoon to combine everything together. When it comes together into a cohesive ball, turn it out onto the counter along with any extra flour in the bowl that hasn’t yet gotten worked in. Knead the dough until all the flour is incorporated and the dough is smooth and elastic to the touch–about five minutes.The dough should still feel moist and slightly tacky. If it’s sticking to your hands and counter-top like bubble gum, work in more flour one tablespoon at a time until it’s smooth and silky. 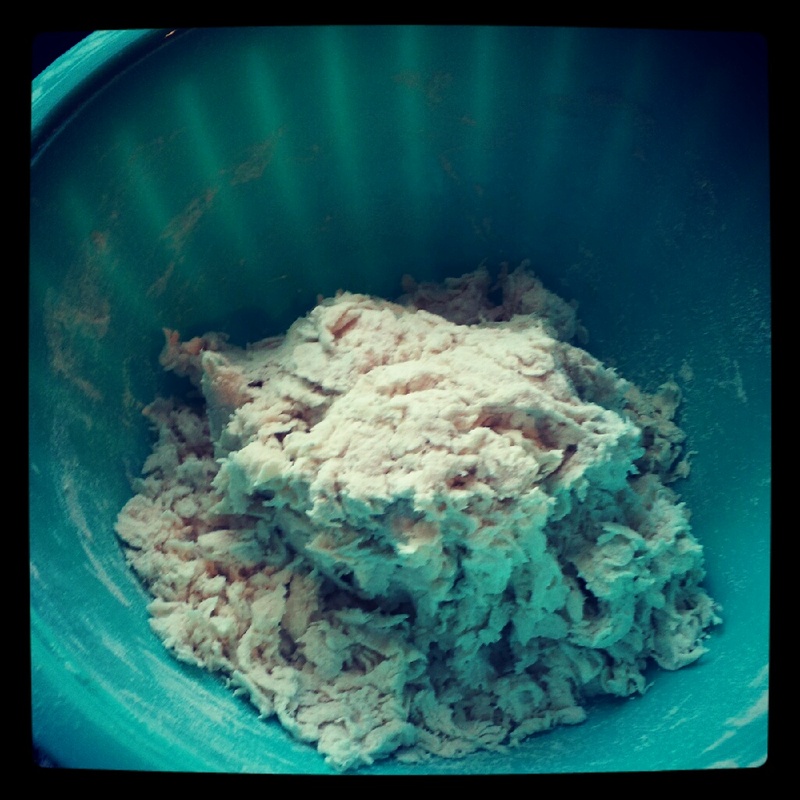 Use a bench scraper to divide the dough in two. Tear off two pieces of parchment paper roughly 12-inches wide. Work one piece of the dough in your hands and form it into a large disk. Lay the disk of dough on the parchment paper. Working from the middle of the dough outwards, use the heel of your hand to gently press the dough outward until it’s about 1/4 of an inch thick or less. You can also use a rolling pin for this part. We like to make free form pies, but if you’d like a circular pie, you can trace a large circle on the back of the parchment to use as a guide. Repeat with the second piece of dough. Note: The dough will stick to the parchment paper, making it easier for you to roll out. You’ll bake the pizza right on the parchment paper. As it cooks, the dough will release from the parchment, and you can slide the paper out before serving. Then just decorate the pizzas with whatever you want. I prefer to broil the pizzas which only takes about 5 minutes each… Seriously, if you decide to broil them, check on them every minute. It only takes 30 seconds for something to go from perfectly broiled to a charred brick. Bon appetit! Triple Smoky Mac ‘n’ Cheese and More Football Food! Wow this is a miracle. I LOVE homemade pizza dough but never do it on weekdays because I can’t wait for the rise…I’m so excited to try this!